Now I’ve finally decided that at least with knitting patterns you make it once properly and then sell on copies. I am hoping that at least if I can create a small arsenal of these it will be the basis for creating and making that I can enjoy without getting completely bored. I’m no publisher, my main line of work is IT so at least I can apply the tools of my trade to getting this in to something readable and nice. What I have done though is write this up. 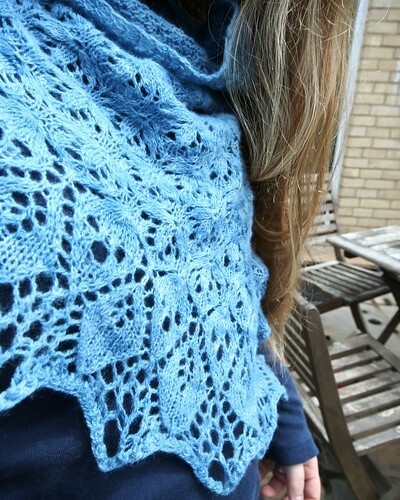 Now I love this pattern and I’m not sure where I stand on a few items including copyright of the original cables and how to get it published without offending any previous designer and or the cable creators. I can say in this instance most of these cables came from a knitting book, a stitch dictionary type book but not ALL of it. Also I created the miter sections myself so that each cable starts correctly on the miter to sit properly within the pattern. 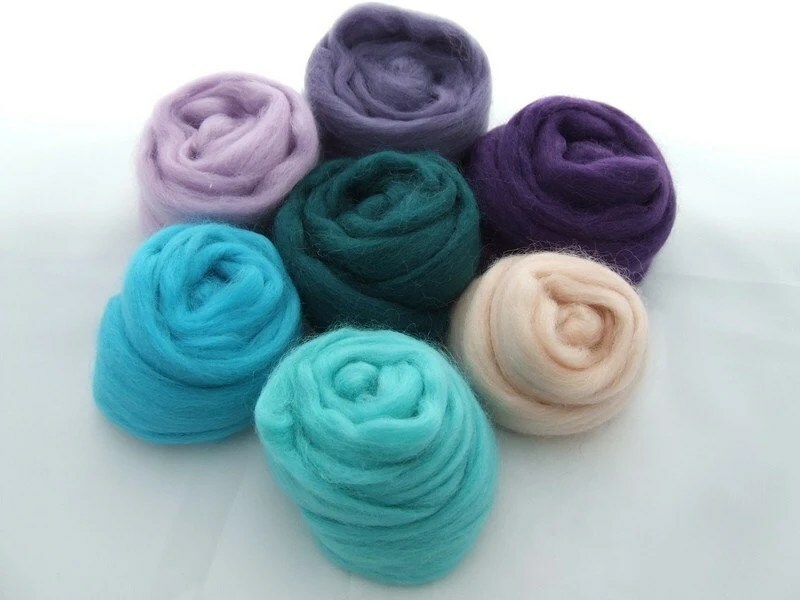 Over on “The Rav” (ravelry) as I like to call it, I went to the test knitters discussion pool and posted a request. Sorry if you can’t get to that link, ravelry is a sign in type site because of the vast content hosted inside. If you are at all interested in the crafts of knitting, spinning, crochet or weaving you should know about it and have an account. So anyway, I posted a request and I was surprised by the vast response to the request. I did this yesterday and I already have what I like to call MINIONS. I know it sounds mean but they are doing my bidding. *cackles evilly* These lovely 5 people are getting this pattern for free whilst they test knit and prove if my charting and pattern writing skills are fully tested. I want to charge for this pattern mainly because it’s the biggest best knit I’ve created so far. I want it to be something special for other people too. I’ll try to keep you informed on how it goes. For now, if you know anything about publishing, copyright or what really needs to be in that pattern that I may have missed, I would really appreciate hearing from you. It’s all new territory for me and I’m not the sort of person who wants to tread on anyones toes making this. Laminaria how I love thee. Yeah, I know I have a ton of projects on the go. 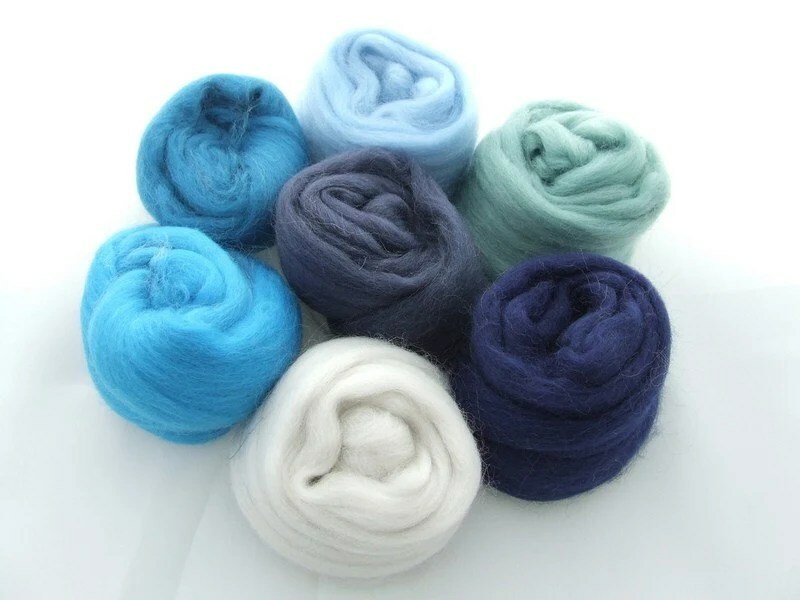 BUT I had a moment, one of those moments where I saw wool, saw pattern and they wanted to make love. I used up 1 of these 3 balls and about 10 yards of the next ball but Laminaria was the way it was meant to be. 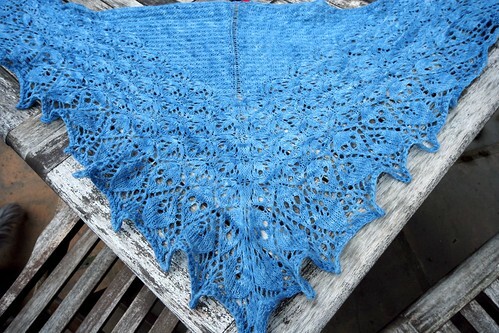 It took me exactly two weeks and 3 days to complete, wash and block the shawl. I was wearing it the very next day. I meant to blog about this for some time but I was too busy being REALLY smug about what I achieved. A quick trip out in to our back yard and I tried to snap a few photos of myself. Pattern notes: I mussed up one of the sssk type things and did a different stitch. I don’t think it detracts, I did the same stitch throughout so it looks like there are no mistakes. I’ve already had several people tell me they love it and it’s not meant to be kept by me. Even my lovely big sister said she wants one EXACTLY the same. 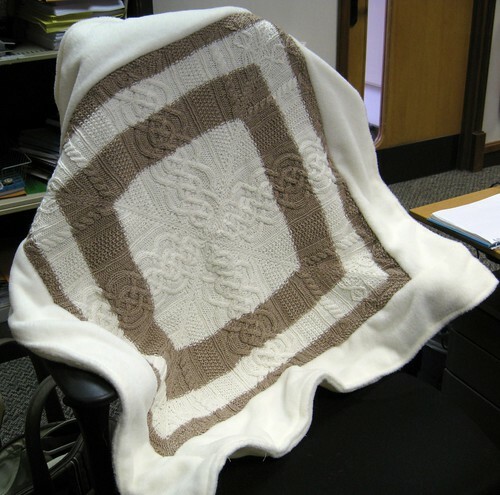 This is one of the few knits I’d love to knit again. The make 9 from 3 stitch appears to be a bind but at least you don’t have to knit more than 3 together in to one stitch. 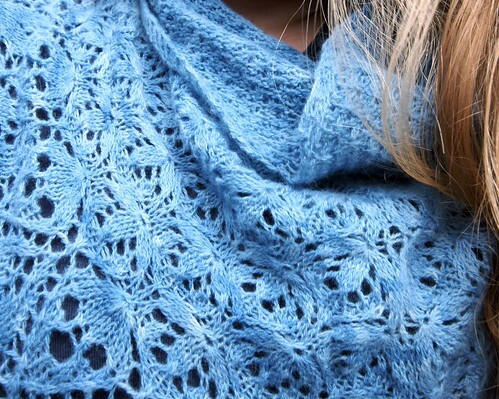 Now I get to wear my entirely blue collection of clothes with a lovely hand knit too! I am SO smitten. work has been busy, I’ve been out most lunch times getting stuff sorted. I’ve now paid the deposit for our wedding. Starting to think about how it should all pan out. I’ve booked with the registrar for us to both give notice. Poetically I booked it on my birthday so Scotty has to take the day off to spend it with me. Erasmus is booked in to the vets next friday for another check up. Another day off, although this is my “free day” from Christmas. Started a pair of super tight mitts for someone at work. They are all black and I’m going for a channel style look, long and slinky. I’m at stalemate with the socks fighting with myself whether to make them short or long. There are many reasons for and against. I just cant decide so they sit unfinished, and therefore unpublished. finally a long awaited stash parcel arrived. I so have to stop spending soon! I’ve been sooo lazy but also soooo busy. I’ve knitted like its been a life long need that could not get out of my system. I’ve taken photos of my achievements and some are now wrapped and ready to be gifted having been washed and blocked. Friday I still felt a little rough but went to the works Christmas party. It was reasonable fun, nice to see everyone happy. Today our friends M&S (better that way round than the other) popped over, we had lunch, lounged around and did the age old playing of a board game. My 90’s addition of Trivial Pursuit questions are very odd and lead to a long game in which we all shrugged lots. Just before I show off the knits, I just want to say WOOHOOO ITS CHRISTMAS!! YAY! BOING BOING! can you tell I’m still 10 inside? 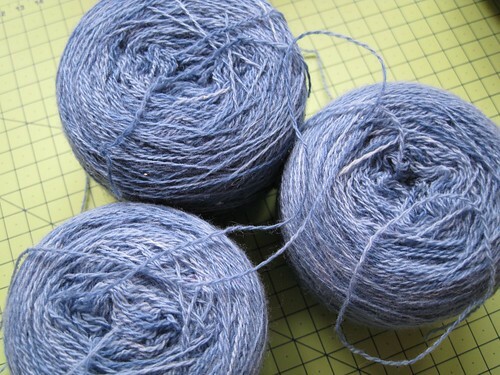 I lurve it, the posh yarn I used was to die for, it made the knit quick and enjoyable. The pattern is a rose leaf center pattern from Victorian Lace Today book, with a moss stitch border. I knitted until there was almost no yarn left at all. A perfect gift knit. This photo does not do these justice. The yarn is thick and smooshy and an rich blood red. 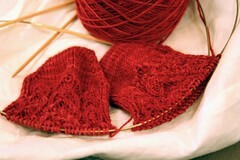 Only 52 stitches in the round for the sock, so even though the cables slow me down the rows are shorter than normal. I found an online stitch pattern maker in java. Warning this broke my fire fox on my mac, but works fine in safari. I planned out the cascading cabled hearts and copied off as a jpg. I will make this available at some point soon. 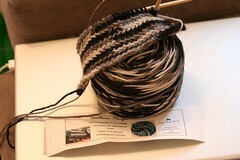 This alpaca merino mix is super fat and looks great as an almost camouflage grey scale mind bender. I’m loving these results too. These items are all on Ravelry and of course in my Flickr knitting set. All the photos for the socks to give to my sister tomorrow are in storage ready to come out. I wish all of you the best of Christmases, and lots of love. You are currently browsing the archives for the knit category.